3.11 or March 11th is the special day for Japan. 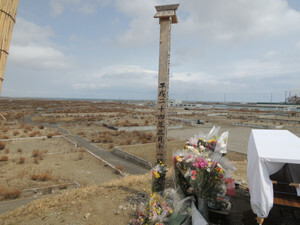 2 years have passed since the terrible natural disaster happened, followed by the nuclear power plant accident. A volunteer group from the information technology field (entrepreneurs etc.) has been active to assist people in the disaster area. As a member of it, I made a tour to visit that area a year ago and yesterday. Simply speaking, a lot of struggling people and slow recovery. Although 2 years have passed, the progress of recovery is limited at a very slow pace. For example, how much rubble were got rid of? In other words, a lot of rubble is still there. Through conversation with people there, I realized the following problems are significant and not resolved yet. It is easy to blame national and regional governments. Of course, there are lot of problems. However, this situation is very challenging. Local governments lost a number of employees and they face overwhelming work. 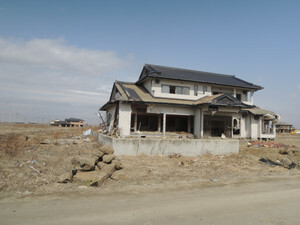 At HIgashi-Matsushima, Tsunami swept almost all houses and buildings. Now vacant there. At HIgashi-Matsushima, a few broken houses are left. Would be scrapped soon, bit it took too long. Slow move of government. From the top of Yuriage Minato JInja at Natori. This empty field.used to be filled with houses and buildings. Only cleaned up without actions for the future..
Around the foot of Minato Jinja, thousands of paper work from all over Japan are placed. Vast empty land left with no plan yet. 50,000 new residents are on the government plan, but less than 100 have been built. This is not only money problem but leadership/organization/people problem. Actions are essential. Around the nuclear power plant, the situation is much more complicated. The ghost of "radioactive" affect people mentally a lot. Practically speaking, mental health should be much bigger problems than actual radioactive. For example, children are not allowed to play outside. Although school teachers says you may drink tap water, very few students do so. 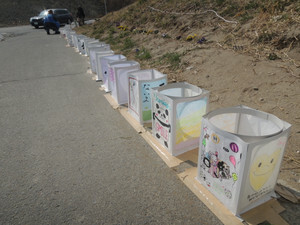 A friend of mine, Mr. Eitaro Kato, leads Bridge for Fukushima. 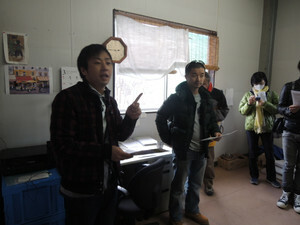 Mr.Ryo Konuma moved to Soma area at Fukushima to become a local leader of Bridge for Fukushima. 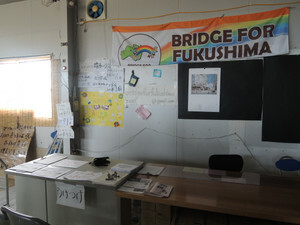 Bridge for Fukushima fosters communities by bridging large corporations and local groups, and assist mothers with baby/infant (providing bottled water, building community, etc.). 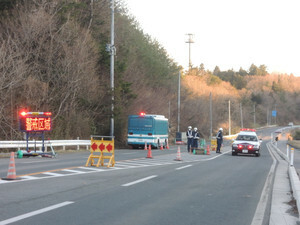 A year ago, special permission was required to enter the 20 km radius from the nuke plant, Now the radius is 10km. However, within 20 km radius, still the national government makes any decisions. So, completely separate from local governments. Weird..
Odaka at Minami-Soma -- 15 km from the nuke plant. 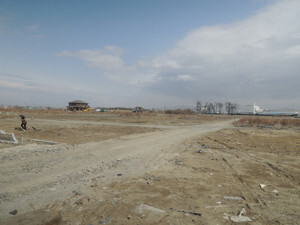 Ms. Kume, 60 years old, is trying to make her facility as a activity outlet at that area. 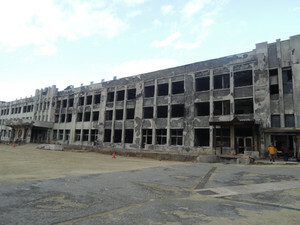 As Tsunami hit this facility, it required a lot of work to clean this up and repair. She complains nearly malfunctional government. Very slow, little communications. 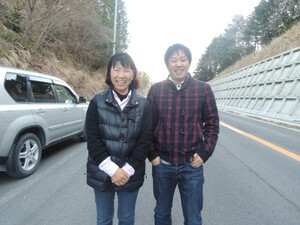 Now her husband works at Fukushima City, living separately. The way government communicates is so bad that she sometimes become mentally unstable such as crying. Electricity is available, but others are not. Water is not there yet. She has a well nearby and let an expert examine water. The result was "no problem"
Within the 20 km radius, nothing can be moved to outside. 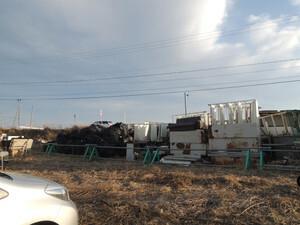 Thus, all the garbage is left next to the facility. .
10 km line from the nuke plant. Radioactive is not so high. Other area outside 10 km, we found higher radioactive. Not so scientific but political line. Ms. Kume and Mr. Konuma. 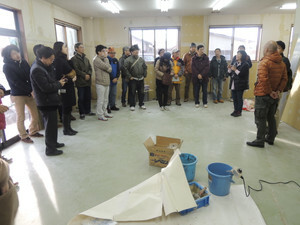 Now leading NPOs at Soma/Minami-Soma, Fukushima..
People want to plan for their future, but it is still difficult. Place to live. Job. From the regional perspective, more time passes, more people leave the region. I know it takes time anyway. Governments are not super-men. Rather than blaming and complaining, we are able to take actions by ourselves. It will also develop ourselves. This is a serious challenge and could be an opportunity. The 60-year old lady says "I am young among our community. I love people and this region. We should be able to make difference and things better".